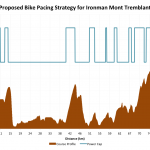 Procrastination is almost as powerful a force for change as repetition; so when I should have been completing my latest article for Endurance Corner I instead decided to work on the integration of course profiles into my Ironman bike analysis spreadsheet. Terrain will obviously influence race performance, a course dominated by climbing is naturally slower than its flatter counterparts, by not factoring this in I am potentially missing useful insights into race day performance. Adding altitude data was straight forward, usefully interpreting it was more of a challenge. 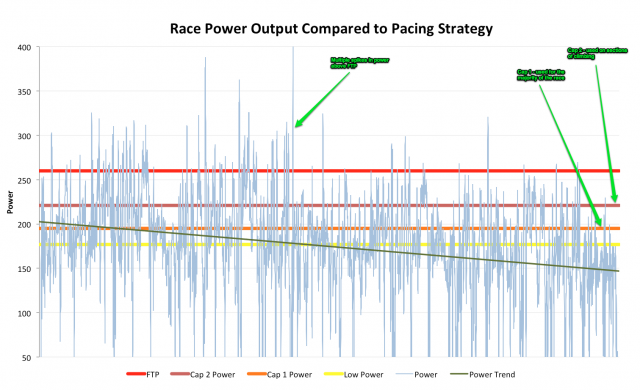 Simply comparing the course profile with race power is useful, during a well executed race I would expect to see higher output on ascents and marginally lower output on descents. As I normally recommend that my athletes cap their power, holding a steady effort through the race with the option to raise it on climbs, I would also expect to see control when climbing and consistency elsewhere. 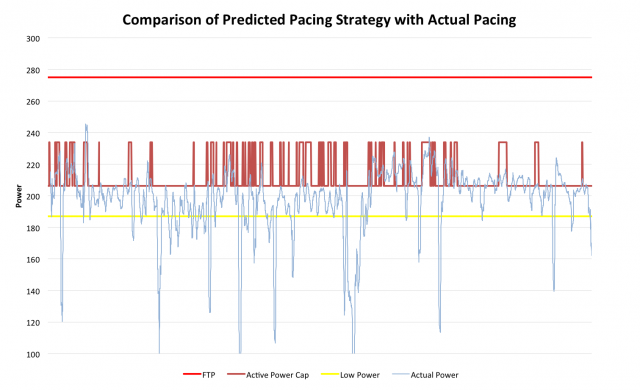 I previously analysed this concept by comparing power against pacing targets, the chart below gives an example taken from an athlete in Austria last year. As the chart shows he spent too much time above cap 2 and notably above FTP during the first half of the race, while spikes were brief, they were costly and there is a marked decline in power output over the course of the Ironman. Knowing this file contained pacing errors relating to riding above target power made it the perfect sample for my updated analysis sheet. The original spreadsheet only considered whether each data point was above any of the caps, it didn’t consider which cap was the appropriate one at that point in time. On a steep climb cap 2 would be the appropriate choice and I would expect an athlete to be above cap 1, on that flat they should be below cap 1. By calculating a gradient from the recorded altitude data I can assign an appropriate power cap to each point in the race. 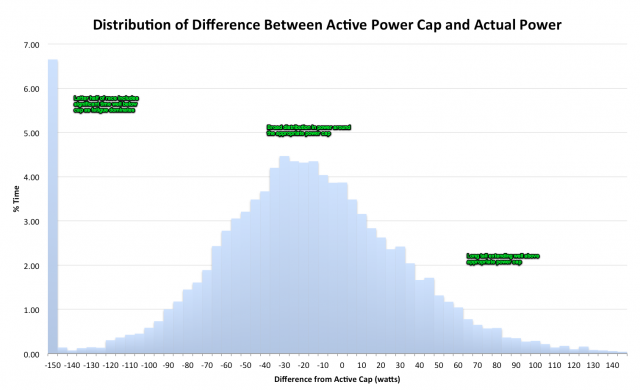 I arbitrarily chose 2% as the gradient that switches an athlete from power cap 1 to cap 2 and then looked at the difference between the power they output at a given moment and the cap that they should be working to. The diagram below shows a sample row from the database to help clarify. As a broad overview I plotted the differences in a histogram (below) showing the amount of time spent above or below the appropriate cap. The Austria data largely met my expectations – a broad distribution with long tails above target and equally a large section below as fatigue played a role. 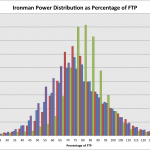 This doesn’t really add much beyond the already present histogram showing the distribution of power as a percentage of FTP (see my previous post for an example of the chart). 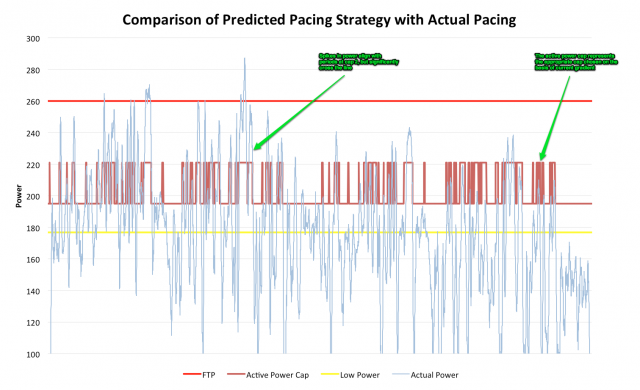 What I really wanted to see is if my athlete’s pacing had matched the strategy, were they working harder in the right places and were they doing so to an appropriate extent? I adapted the existing power and pacing comparison chart using the idea of an active power cap, that is determining the appropriate cap from the gradient. The chart below shows the athlete tended to spike power on climbs when it was appropriate to do so, but as we know the bigger issue was the extent to which those spikes cross over the active power cap. A final graph to test the point. So far everything met my expectations, the new charts may not be revelatory, but they were another means of assessing race performance. I took data from an exceptionally well paced race – Nick Baldwin’s Kona 2011 performance that I looked at last year, and ran it through the spreadsheet. Nick was working to his own carefully strategy, but the chart below shows he was often raising power on hill, doing so in a very controlled manner. The addition of altitude to the analysis spreadsheet has potential, it provides a view of pacing that better reflects the decisions that should be made around terrain. Of course it has shortcomings, many conditions remain out of the equation and the model is limited to an arbitrary split between two possible power targets. 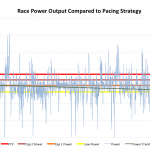 But it also raises an interesting idea: this could be used to plan power targets around a course profile before a race allowing a more refined approach to race pacing. While the simplicity of the cap rule makes it easy for an athlete to implement during a race, on a climb heavy course it potentially allows them to overwork. I normally advise that on longer climbs they should try to stay at the lower cap rather than raising their effort for prolonged periods. Breaking down the pacing around points on the course might enable a better assessment of how much to push and where it is best to do so. Whether that could actually be practically applied is another matter and in the mean time the simple guideline to go a bit harder on the climbs and keep watch on how you feel does a good job. An addendum probably shouldn’t match the original post in length, but having spent an hour or two expanding on yesterday’s topic a thorough description seemed appropriate. I’ll put the new analysis to work when I look at some example files and will also test the concept of planning a power strategy from course profiles.